Running a restaurant is a hectic task requiring the entire day's attention and even after the restaurant shuts down, the restaurateur's work is never done. They need to compile information, loom at sales, count profits and what not. While efficient managers and employees help ease the workload even they cannot be depended upon completely. In such a situation where managing one single restaurant is such an enormous task, running different outlets appears like an impossible dream. That is the place where we need a smart restaurant management system. The most concerning issue that restaurateurs confront while running various outlets and restaurant franchises, is having no control over the tasks. One has to depend on the reports sent by the restaurant manager of every outlet about the business. This is a manual process that is tedious and furthermore has the scope for blunders and misappropriations. A restaurant management system gives the real-time information and reports of all the outlets that you can see anytime from your mobile. It gives the owner the complete command over the tasks of the restaurant. You can control everything starting from inventory to customer satisfaction from anywhere and from any device. The following are a couple of ways by which a restaurant management system or a comprehensive restaurant POS helps in dealing with numerous outlets of a restaurant flawlessly. Stock and Inventory Management: When you are running numerous outlets, monitoring the stock expended at every outlet can end up being tedious. A coordinated restaurant management system gives you detailed reports of the daily stock utilization of every outlet. If you have a Central Kitchen, you can deal with the course of stock effortlessly in view of the stock requirement of each outlet. It also enables you to set re-order levels for raw materials so you can order for the particular item before it goes out of stock. 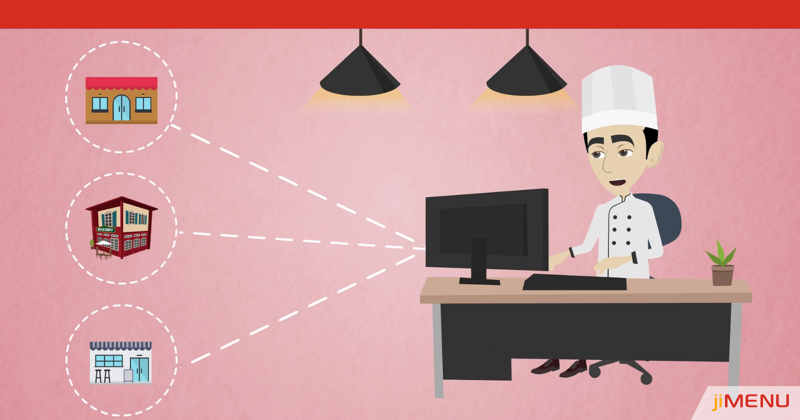 You can create purchase orders right in the restaurant management system. An automated email is sent to the merchants when the purchase order is raised and stays open until all the items are received at the outlet. Along these lines, you can monitor the status of the stock items purchased and received without visiting each outlet. Central Menu Management: When you are running numerous outlets of a similar brand, presenting a change in the menu turns into a harrowing task since your IT guy needs to manually update the menu in the POS at every outlet. It is still achievable if you are running 4-5 outlets. However, envision the time and effort required in updating the menu across all the outlets if you are running a chain of 50 restaurants spread across the nation. A restaurant management system takes care of this issue effectively. All the changes made in the central POS Menu is reflected immediately across all, or whichever outlet you need to them be updated. This saves time and dispenses with the scope of any mistakes. Central CRM: A restaurant management system comes furnished with a central CRM and has now become the need of the hour. For one, it enables you to have one central customer database. This means, once a customer's details are stored in the CRM, their contact details and ordering history is automatically visible to the other outlets too. In view of this data, your staff can upsell things regardless of whether the customer has visited that specific outlet for the first time. Furthermore, it works extremely well in running Loyalty Programs and Reward Points that can be used by the client if they are visiting a different outlet. Real-Time Reporting and Analytics: While managing different outlets it is not feasible for the owner to be physically present at every single one of them all the time. This leaves a lot of scope for misappropriations and internal theft. Features in the restaurant management systems take care of this issue by giving the owner ongoing updates of what is going on in his numerous branches. Along these lines, it is simple for him to monitor all that is being done. Restaurant management solution gives you remote agency over every outlet so that as the owner you can deal with any outlet from anyplace on the planet. Vendor Management: A restaurant has different stock requirements which imply that you need to manage various merchants and providers. As the number of outlets increase, managing an extensive number of merchants turns into a humungous task. Vendor management is an essential feature of the restaurant management system that enables you to create and manage seller profiles of various outlets at a central level. You can include the contact details of different merchants and even these sellers can sign in, read, edit and add comments to the purchase order. In the new time of technological developments embrace restaurant management systems and run that dream chain of restaurants effortlessly and effectively. Get in touch for more details.